Cedar Falls is a residential community located in Eastern Iowa. It has traditionally been a bedroom community to Waterloo, its neighbor to the east and the county seat of Black Hawk County. Cedar Falls is the home of the University of Northern Iowa (UNI), enrollment about 13,000. Cedar Falls was developed on the banks of the Cedar River, which bisects a portion of the city. The city reports that the Cedar River has crested above flood stage at least 94 times since 1929. Since 1990, Black Hawk County has had six federally declared disasters for floods (FEMA 2001). The most recent and notable major flooding event in Cedar Falls occurred in 2008. The Ice House Museum, several feet under water during the 2008 flood. Photo by Denny Bowman, video production supervisor at City of Cedar Falls, Iowa. About 25 percent of the city is within the 100- and 500-year floodplain as determined by official Flood Insurance Rate Maps (FIRMs) for the community. The majority of the floodplain, about 80 percent, is located in the North Cedar area, which accounts for about one-third of the city land area. It is estimated that 840 one- to four-family residential structures are located within the floodplain, and 738 structures not classified as residential are in the flood hazard area. In total, it is estimated that 2,677 persons reside year-round in the flood hazard area (HMP Update 2010). Because of the location of Cedar Falls in relation to the Cedar River, Black Hawk Creek, Snag Creek, Beaver Creek, Dry Run Creek, and several smaller unnamed creeks, the City of Cedar Falls can expect to experience future floods. In response, the city has incorporated a variety of mitigation and recovery strategies in an effort to make the community more resilient. These include: structural fixes, improvements to the stormwater system, property buyouts, floodplain management, floodplain map updates, and regular updates to the Hazard Mitigation Plan. These strategies are the focus of this case study. Between 1998 and 2000, the city cooperated with the U.S. Army Corps of Engineers in the construction of a flood control levee under the Corps of Engineers Continuing Authorities Program. The levee is approximately one mile long and protects 63 acres of the city. Prior to the project, no flood protection existed between the river and the downtown business district or municipal water treatment plant. The project was partially completed when the floods of 1999 occurred, alleviating some of the impacts on the downtown area. 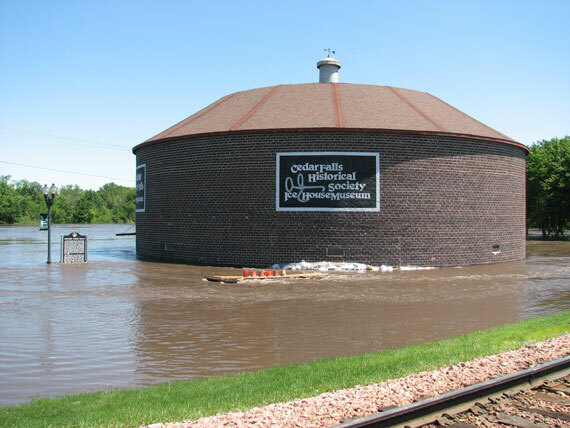 In 2003, Cedar Falls Utilities (CFU) initiated an independent flood protection plan that included construction of a "flood bladder" that could be inflated to the 100-year level and then removed following a flood. Despite the projects undertaken by both the city and CFU, the flood of 2008 caused massive destruction. The flood bladder system CFU had in place was designed to withstand a 100-year flood event, but the 2008 flood was estimated to be much closer to a 500-year flood event. The levee nearly failed but was reinforced with sandbags at several points and fortunately held. As a result of the impacts experienced in the 2008 flood, CFU renewed efforts to establish more permanent protection measures. They sought and obtained funding from FEMA and the state of Iowa for a new levee that would tie into the city's existing levee. This structure is currently under construction. The city also decided to raise the existing levee to achieve the 500-year flood protection level. This added protection design is now under review by the U.S. Army Corps of Engineers, and work is expected to begin in 2013. Together, these projects will ensure better protection of the city's key infrastructure: water, sewer, electric, natural gas, and telecommunications (Internet services). In addition to major structural projects, the city continues to alleviate the risk of flooding by making improvements to the stormwater system. The city has constructed a new storm sewer, improving old or undersized storm sewers, constructing water detention basins, and requiring new large developments in the community to mitigate any stormwater runoff that they would create. The city has also adopted several EPA–mandated stormwater ordinances in recent years that help improve general water quality and also to pursue methods to reduce flows where possible. The city has also increased its focus on natural stormwater drainage through expanding its green infrastructure. It is removing structures from the floodplain through the flood buyout program and designating them as greenway to ensure they remain undeveloped in the future. The system of greenways will help with natural stormwater drainage, which also mitigates flood risk. See the "Property Buyouts" and "Comprehensive Plan" sections of this case study for additional detail. The "Beach House" facility, situated just a few feet from the bank of the Cedar River, is almost completely inundated during a flooding event. Photo by David Wieland, Cedar Rapids City Council Iowa. After experiencing significant property damage as the result of back-to-back floods in 1993, Cedar Falls began actively pursuing participation in FEMA's hazard mitigation buyout program. The city applied for and successfully obtained Hazard Mitigation Grant Program (HMGP) and HUD Community Development Block Grant (CDBG) program funds to buy out homes that were frequently flooded. The city established a flood buy-out program and dedicated a staff person to coordinate the program and handle the property closings. Between December 1993 and September 1997, the city purchased 99 properties, including 98 homes and one lot. Ninety-six homes were demolished and two were moved to higher land at a cost of $4,330,000 (FEMA 2001). The city has maintained the flood buy-out program (managed by the same staff person) since the 1993 floods. The program continues to rely heavily on HMGP funds for flood buy-outs with CDBG funding for other program elements and "in-kind" contributions from the city for services such as staffing (which are also reimbursed by federal programs). The city also maintains a buy-out "line item" with sufficient funding to purchase one or two properties during non-flooding years if a property should become available in the targeted flood buy-out area. The city has applied for FEMA funds every time there has been a federally declared disaster for Black Hawk County or for the State of Iowa (disaster declarations have also been issued for blizzards and severe storms). In addition to the funds obtained after the 1993 floods, the city received funding in 1999 and 2008 as a result of flooding. In total, the city has facilitated the purchase and removal of 331 floodplain properties (most of those residential properties including mobile home parks and a few businesses) for a total cost of $19 million. The bulk of the acquisition dollars are covered by the state and federal governments (through funding available through FEMA), with the city providing "in-kind" matches. Most of these buy-outs have occurred in the North Cedar Falls area, located north of the Cedar River. All properties acquired by the city must be preserved as permanent open space. Community gardens have been created on some of the buy-out properties. According to a representative from the Iowa Department of Natural Resources, the National Flood Insurance Program (NFIP) Data Exchange lists 72 repetitive loss properties and four validated residential severe repetitive loss structures for Cedar Falls (39 of which are shown as unmitigated) . The city maintains a list of structures located in flood hazard areas and is dedicated to seeking continued assistance to purchase and remove these structures from harm's way. The city has also strengthened its floodplain management strategies through updates to the floodplain ordinance, zoning and subdivision ordinances, and comprehensive plan. The City of Cedar Falls has participated in the National Flood Insurance Program (NFIP) since 1985 and was utilizing the standard FEMA–mandated floodplain ordinance until 2010, when the city adopted a revised floodplain ordinance that exceeds FEMA requirements. It adopted the 500-year floodplain boundary as the "locally regulated floodplain" and requires structures located within the boundary to be elevated one foot above the 500-year flood elevation (in comparison, FEMA recognizes the 100-year floodplain as the "base flood"). The city also prohibits both the creation of new development lots within this boundary and FEMA–approved Letter of Map Revisions (LOMRs) involving fill activities or other land-altering activities. The ordinance limits fill activity to no more than three feet in any location, and no more than one-third of the property may be filled. Additionally, the ordinance restricts the size of detached accessory structures that are not subject to elevation and requires accessory structures that exceed these dimensions to be elevated to the 500-year protection level. Finally, the city does not allow any new lots to be platted for development in the floodplain. It also has a provision (29-156-d) that requires critical facilities (including hospital, municipal government buildings, schools, and residential facilities for elderly or infirm/handicapped persons) to be located outside the 500-year floodplain boundaries. To view the ordinance in its entirety, visit www.cedarfalls.com/index.aspx?NID=882. It should be noted that the city's adoption of the 500-year floodplain as the locally regulated floodplain does not impact flood insurance requirements. FEMA requires flood insurance based upon the 100-year flood boundary and flood elevations. The city has three overlay districts pertaining to flooding in its zoning ordinance: floodway overlay district (F-W), floodway fringe overlay district (F-F), and general floodplain overlay district (F-P). Each overlay district has distinctive geographical boundaries on the floodplain map. Once it is determined which overlay the property is in, property owners can go to the appropriate section of the ordinance to determine permitted uses, conditional uses, and performance standards for the property. The subdivision ordinance, also updated in 2010, complements the floodplain ordinance. It includes natural resource measures such as prohibiting the establishment of new building lots within the floodplain and also incorporated language to protect sensitive lands such as floodplain and wetland areas. The city also completed a 20-year comprehensive plan update in 2012. The comprehensive plan introduces some improved stormwater management strategies and natural resource protections and addresses other planning issues such as improved transportation accommodations. The Land Use Map also delineates the general floodplain areas of the city and designates these floodplain areas in the land use plan as "unsuitable" for development (i.e., "greenbelt" designations). This helps to reinforce the main provisions of the city's floodplain ordinance. Most importantly, policies and recommendations found within the comprehensive plan are consistent with the Cedar Falls Hazard Mitigation Plan. The city updated its floodplain maps in 2004 because of a number of major infrastructure projects (mainly roads and highways) constructed during the 1990s that have impacted stormwater and flooding patterns. In some cases new roadways involved large excavations and creation of large stormwater detention areas that helped to reduce floodplain boundaries along some tributaries. In other cases, some structures impeded water and created deeper flooding profiles. The city adopted the new floodplain map update in July 2011. However, it had been using the updated maps for establishing floodplain boundaries and elevations since the 2008 flood. Hundreds of people voluntarily arrived at the scene to help shore up the flood levee. Photo by Denny Bowman, video production supervisor at City of Cedar Falls, Iowa. The city adopted its first Hazard Mitigation Plan in 2003. The plan, which must be regularly updated in order to keep the city eligible for FEMA mitigation grant funding, was updated in 2010. The next update is scheduled for 2013. For the next plan, Cedar Falls will be part of a larger countywide (multi-jurisdiction) plan. One of the goals of the existing plan is to return to pre-disaster or improved conditions as soon as possible after a disaster occurs. The plan includes a series of future hazard mitigation activities involving a wide range of hazards. Several of the activities are related to flooding — both river floods and flash floods. Each activity has an action step, analysis, timeline for completion, estimated cost, responsible party, and information on related goals. The plan may be viewed at www.cedarfalls.com/DocumentCenter/View/740. 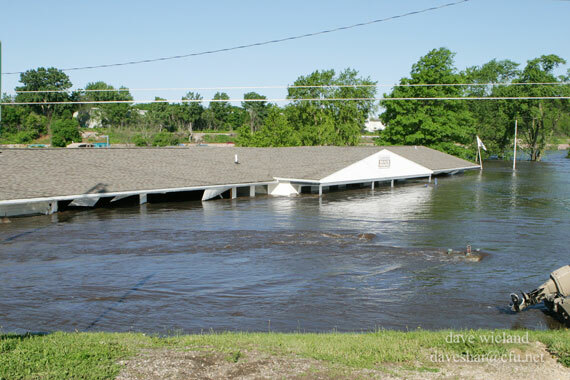 Following the 2008 floods, the state legislature established the Iowa Flood Center (IFC) to serve as a clearinghouse for research and education efforts relating to statewide floodplain matters. IFC is based at the University of Iowa campus, 80 miles south of Cedar Falls. The IFC is actively engaged in research studies for Iowa communities producing hydrologic flood models and flood forecasting. One of its objectives is to get better flood prediction tools for communities along various river corridors in Iowa. Its services and resources are available to the City of Cedar Falls. Iowa professionals (including engineers, planners, emergency responders, and many others) have formed a state stormwater/floodplain manager's chapter of the Association of State Floodplain Managers — Iowa Floodplain and Stormwater Management Association (IFSMA). The principal goal of the association is to help improve or normalize local stormwater and floodplain management practices. The Iowa Rivers Coalition advocates state legislative action on river and stormwater issues. A more local group, the Cedar River Watershed Coalition, has been formed to try to find solutions to flooding issues in the Cedar River watershed. The group is spearheaded by a representative from the Iowa Department of Natural Resources and includes a wide range of community activists, environmental groups, numerous communities, and agriculture interests. Although structural fixes have successfully alleviated some of the impacts of floods in Cedar Falls, they cannot eliminate the threat, probability, or vulnerability of future impacts from major flooding events. For example, the CFU power plant lies in close proximity to the Cedar River. It is possible that, if a large enough flood occurred, the power plant would be inoperable. Additionally, a levee failure could affect the water reclamation facility, which is also located in an identified flood area. Either of these outcomes could have catastrophic effects on the community. The city recognizes these vulnerabilities, and protecting the waste water treatment plant was one of the main reasons for the city and CFU levy upgrades and additional protection measures described above. The properties that house the city's key infrastructure cannot be bought out as easily or affordably as other properties. Additionally, they must be present and operational for the city to survive. Cities should give thought during the site selection process for new facilities of this type. They should consider adopting critical facilities language like that in the Cedar Falls floodplain ordinance. For existing facilities, communities need to take steps to protect this infrastructure before a disaster occurs and also have a plan in place to return operations as quickly as possible in the event of a catastrophic storm. Community leaders should be aware that sometimes structural fixes can work against community goals of resilience because they provide a false sense of security to residents. 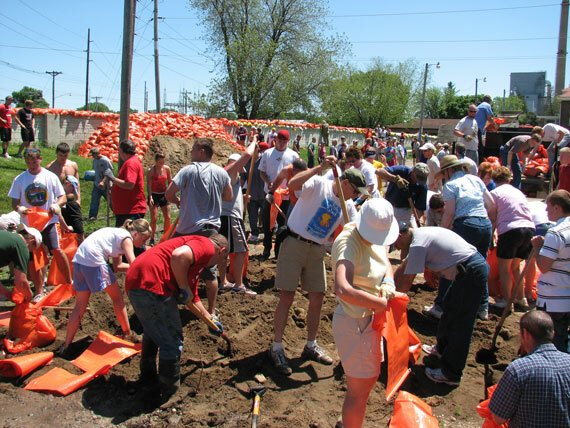 To increase a community's resilience and ability to recover from a major event, it is important to incorporate a variety of mitigation and recovery strategies like those used by the City of Cedar Falls. This case study was written by Erin Musiol, AICP, senior program development and research associate at the American Planning Association, with Marty Ryan, city planner at the City of Cedar Falls, Iowa. Black Hawk County Citizens, Black Hawk County Government, Institute for Decision Making. 2008. "Governing the Future: 2028 Vision, Motivating values, and 3-5 Year Shared Strategic Direction Plan." Cappuccio, Bill. 2012. Iowa Department of Natural Resources. E-mail interview with Erin Musiol, October 9. City of Cedar Falls Hazard Mitigation Plan Update. 2010. Available at www.cedarfalls.com/DocumentCenter/Home/View/740. Comprehensive Plan for the City of Cedar Falls. 2012. Available at www.cedarfalls.com/DocumentCenter/Home/View/2418. Federal Emergency Management Agency. 2001. "Buyouts Dramatically Demonstrate Avoided Flood Damage: Two Cities, One Tale." Available at http://mitigation.eeri.org/files/resources-for-success/00016.pdf. Federal Emergency Management Agency. 2009. "Mitigation Assessment Team Report: Midwest Floods of 2008 in Iowa & Wisconsin." FEMA P-765. Chapter 5.